The Googlified blog reports that Google Labs are experimenting with a new style of search result customizations: digg-style voting buttons that allow users to customize their search experience. If the experiment is a success, it’s conceivable that the results of such voting could be folded back into the general search results, complementing and potentially even replacing the PageRank algorithm. This experiment lets you influence your search experience by adding, moving, and removing search results. When you search for the same keywords again, you’ll continue to see those changes. This button will move the result to the top of the page and add this orange marker (fig. 1a) next to it so you can easily recognize it. 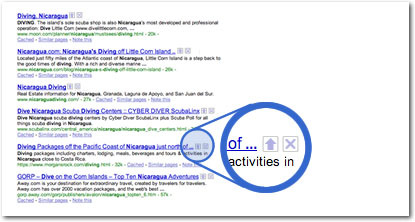 The result(s) you promote will appear at the top whenever you search for the same keyword(s) in the future. This button will remove the result, and it will remain hidden when you search for the same keyword(s) in the future. While initially an enhancement that is confined to that user’s results, you can bet that Google will be monitoring very closely the data they track as a result of this experiment, and comparing it to how well their existing algorithm performs. PageRank can only go so far in delivering customized search results, and this is one interesting way of improving the individual experience for Google’s users.